Ever since the Winter Solstice, the return of the light has incrementally brought us to the point that we have finally begun to thaw out. The days are showing signs of getting longer, and some animals are beginning to poke their heads out to rummage around and check out the weather. This year, for those of us in the Pacific northwest and Vancouver, we have been greeted with unseasonably warm temperatures and sunny skies. This means that our spring herb season is kicking off sooner than expected! In Traditional Chinese Medicine (TCM), each season marks the next chapter of the body’s cycle, and spring is the liver time. Although spring doesn’t officially kick off until the Equinox in March, nature is already furnishing itself with the medicines necessary to do the liver work post-winter. As animals come out of hibernation, the vegetation that tends to be available to them comes in the form of young shoots and buds, all which have concentrated medicines. The animals eat these to purge their bodies of winter wastes and to raise digestion into higher metabolism again. Although humans now have access to a global market that provides any kind of food year round, the original, localized diet would have meant that we spent the majority of winter consuming starches and meat. It’s because those were the easiest the store without spoilage. Unlike fresh produce that goes bad within a week’s time (unless fermented or preserved), root vegetables, dried corn, and cured meats could last all winter. These calorie rich foods give humans the energy they need to stay warm in the winter months. All those heavy foods take a longer time to digest, and over the winter months it means a more sluggish, somewhat stagnant digestive system. Once spring time comes, the diversity of food choices begin to come back, and the first plants to appear in the wild are related to the liver. They are packed with bitter medicine and enzymes that aid the body in purification for the gathering season of summer. For this reason, it is a wonderful time to forage for the small, delicate greens now appearing. Not only are they tasty, but you will feel a certain lightness return to your body and consciousness if you include them in your diet regularly. Dandelion (taraxum officinale) is probably the most famous, and the most abundant. It’s an introduced species to North America, brought here by early European settlers. 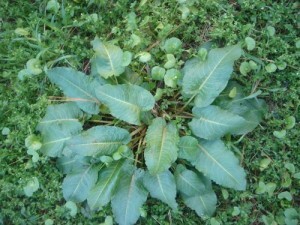 At this time of year, the polysaccharides (sugars) in the root have mostly been expended from the wintertime, so what remains is a concentrated source of yellow, bitter medicine. Yellow is the colour associated with the digestive system in the medicine world, and this form of bitterness is much lacking in the modern western diet. Bitter regulates the digestive system, frees up stagnation, and gets the gallbladder to excrete bile. Bitter gives the body much needed chemistries for purification. 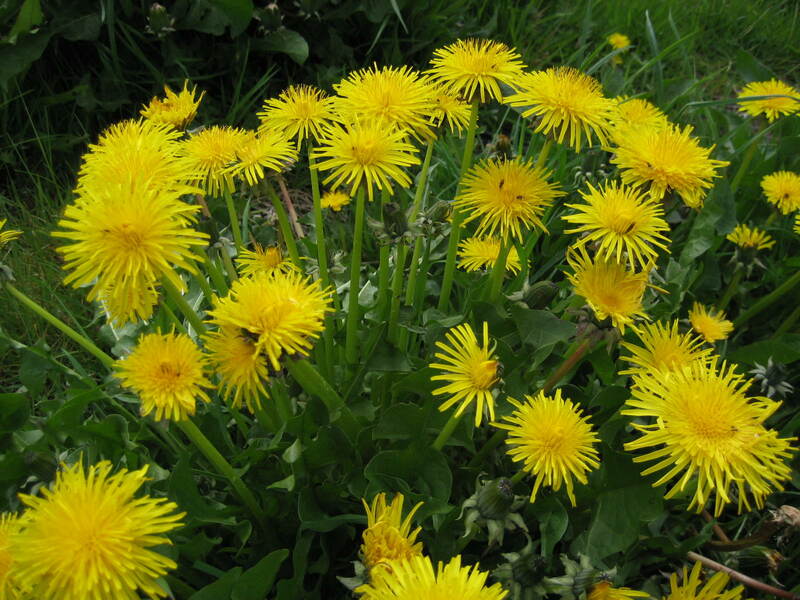 A lot of scientific research on dandelion is revealing that the root can selectively target cancer cells, and this has gained a lot of attention in the modern medicine community. The fresh dandelion greens appearing now until the end of March are very tender and delicate, with a more palatable taste in salads, compared to the more mature leaves you’d find in the summer time. The roots can be cleaned and added to soups with other vegetables. Stinging nettle (urtica urens) is another great addition. Most people shy away from this plant because they believe it will harm them, due to the name alone. 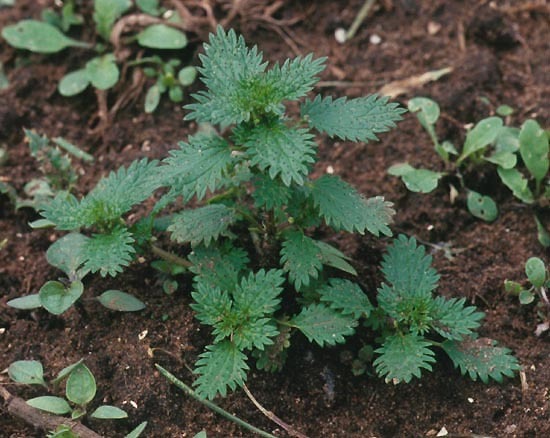 There are many species of nettle which grow in the lower mainland, and urtica urens is the one which is safe to use as medicine. Its sting has serotonergic properties, meaning it stimulates the serotonin system of the body. Many people report that minutes after the initial sting, they actually notice improvements in their mood. So it seems that nettle’s sting is a gentle request to go away, just long enough until we feel better about having done so! For the purposes of springtime, you can snip the new leaf growth right at the top of the plant and dry it out for use as tea. Fresh nettle can be added to stir fries and soups, as it is extremely nutritious. As for the sting, it doesn’t actually penetrate the skin. The top of the stinging hair breaks open when it’s brushed against, and spills formic acid onto the skin, causing a micro burn. However, it fades quickly, with some mood elevating results, apparently! When nettle is cooked, frozen or dried out, the sting goes away, though some people report very minor stings from dried, whole nettle. Nettle is the great blood tonifier of the herbal kingdom and is a wonderful restorative for the nervous system too (which some refer to as “adrenals”). Its most popular use in herbalism is as a preventative of seasonal allergies, which means if you eat it now then come April your hayfever symptoms might not be as severe. Abundant chickweed, with its tiny white flowers. 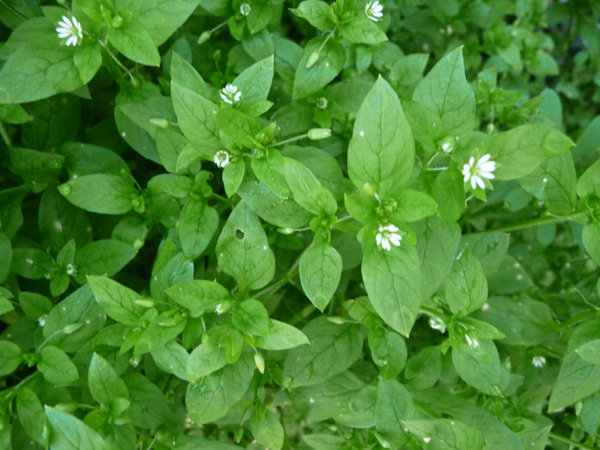 Chickweed (stellaria media) is another nutritious find at this time of year. It tends to grow in tangled vines and has a mild, piquant flavour. The usual part that’s harvested is the leaves for adding to salads and soups. It also has that bitter edge to its flavour, which helps the liver get a move on for the coming season. Yellowdock (rumex crispus) is a powerhouse for the liver, and its leaves are really only edible in the early stages of spring when the growth is the youngest. Some people are sensitive to oxalic acid because their livers can’t process it very well, and they should stay away from this herb. For those that aren’t sure if they’re sensitive or not, you can try eating a small number of beet tops or swiss chard leaves. They also contain oxalic acid. You’ll know you can’t process oxalic acid because you’ll become nauseous, get abdominal cramps, and probably diarrhea. Small amounts won’t harm you though, it’ll just feel uncomfortable. If you have this sensitivity, then don’t go for yellow dock, and instead stick to other spring time medicinals. s Clover, easy to recognize! Red clover (trifolium) grows practically everywhere, in both red and white forms. Many herbalists believe that the red is more potent, and I tend to agree. The entire above ground plant is edible, including the flower which has a slightly sweet taste due to the nectar inside. 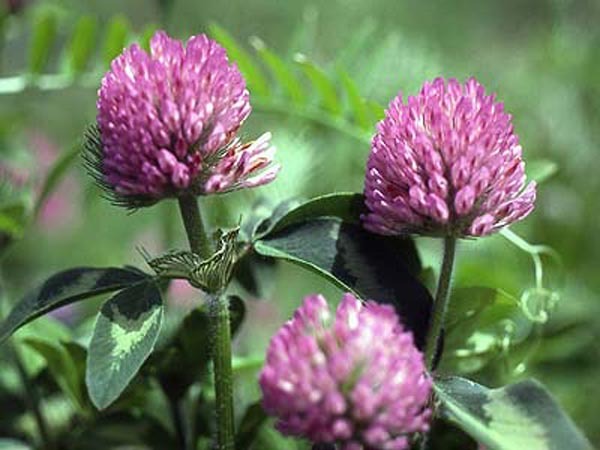 Red clover has been a topic of research in recent years because it too has anti-cancer properties, and reduces the harsh side effects of chemotherapy. The flowers are also used to help quell menopausal hot flashes due to their phytoestrogenic properties. In spring time though, it just serves as a wonderful addition to salad greens. The flowers are really beautiful and seem to be a favorite of bumblebees and honeybees! These are just a few edible wild plants that appear at this time of year, there are many others. There’s enough that could be said on any of them that they deserve their own articles, but this should provide a snippet of what’s possible! Getting acquainted with what is local can take time, and it helps to know an herbalist who is able to identify the plants. Nothing beats meeting a plant in person, getting to know its personality, and seeing the kind of environment it grows in. Once you make that connection with a plant, you tend to start noticing it more and more in your daily life. What you might’ve thought of as “weeds” before now seem purposeful and useful. You may find yourself grabbing little bunches of edibles on your way home from work one day to add to a delicious salad. As with any herbal medicine, it’s important to sample things and start small. If you have a particular condition in mind that you’d like to try treating with an herb, or if you have any pre-existing conditions and you’re concerned about these edibles being incompatible with your health, you should consult an experienced herbalist. On the brighter side, wild harvesting is fun, and these plants tend to grow in abundance yearly. If you find a big patch of them, consider taking only what you need, and not taking the entire plant so that it can continue to grow and prosper with the coming season. “What you need” is generally defined by immediate needs, and not the hording mentality. If you pick all the leaves or harvest all the roots in an area, then the plants may not grow back. Think sustainably. Besides, if you’ve been successfully using the springtime herbs in your diet, then your body will already be prepared for the next season! Disclaimer: this article does not instruct in how to identify herbs, only their uses and benefits. For wild identification, please consult a field guide or a knowledgeable expert before harvesting.